The Stags were at home for the first time in 2019 last Saturday as they welcomed Midland 2 league leaders Blairgowrie to Glensburgh for the Caledonia Shield semi final. 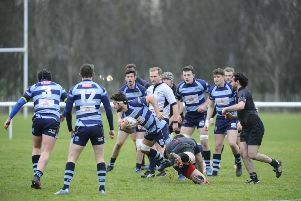 The Perthshire side had only lost once all season and had already claimed the scalp of Caley 1 side Ellon in the previous round so a close game was expected. his man and run in at the corner. Skelton was unable to add the extras. The home side continued to dominate possession but on 20 minutes and against the run of play Blairgowrie opened their account. A Stags attack broke down midway inside the visitors half and Blair launched a swift counter attack and the winger to run in at the corner. The conversion attempt was off target. It was level at 5-5 at the break. The second half remained tight in the opening few minutes. On 50 minutes a neck injury to one of the Blairgowrie players resulted in the game being stopped and an ambulance called. The game was moved to the second team’s pitch for the last 30 minutes. On 55 minutes, Blair were awarded a penalty and the kick was moved 10 metres forward after dissent from the home side. The easier kick was successful to give the visitors an 8-5 lead. 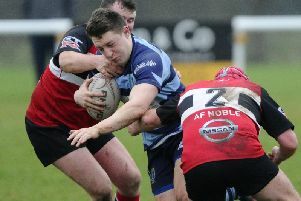 Grangemouth moved back ahead when Dempsey darted up the narrow side from a lineout before cutting inside the fullback for the score. Skelton was unable to add the extras. This set up a very tense final 10 minutes. Blairgowrie were just short with a long range penalty attempt on 70 minutes before the decisive score followed a few minutes later. The visitors’ backs floated a pass in midfield and Skelton went for the interception. The ball bounced off his leg before he hacked upfield and collected a kindly bounce to run in under the sticks. The stand off converted his own score. The Stags now progress to the final of the Shield and will take on Strathmore on February 16. The venue will be decided in the next few days.